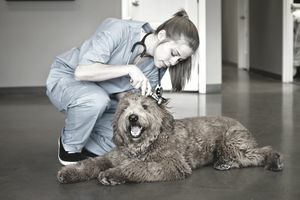 Attending veterinary school is an expensive proposition, but there are many scholarships available to help defray the cost. Here are some of the scholarships that may be of interest to veterinary students. Please note that while we have focused primarily on nationally available scholarship opportunities, there are many additional options focused on residents of specific states or attendees of specific colleges. The AABP offers 14 Bovine Veterinary Student Recognition Awards each year. Students may apply for the $1,500 awards during their second or third year of study. Award recipients are selected based on academic achievement, interest in bovine medicine, work experience, career goals, and recommendations. Applications are due March 15. The AAEP & Zoetis offer $4,000 scholarships to veterinary students with an interest in pursuing a career in equine medicine. Students may apply in the spring semester of their fourth year of study. The American Kennel Club has awarded scholarships to veterinary students for more than 20 years. Each AVMA-accredited vet school in the U.S. nominates four candidates for the awards. Candidates are selected based on academic achievement, interest in purebred dogs, and financial need. Awards generally range from $2,000 to $7,000. The AVMF awards scholarships to veterinary students in their first three years of study (amounts may vary). Additional scholarships are available, including a women’s scholarship ($500) and a feline scholarship ($2,500). Applications are due May 15. The AVMF also partners with Zoetis and Merck for scholarship programs that begin accepting applications in the fall. Markel Insurance Company and the American Association of Equine Practitioners have partnered to offer eight $2,500 scholarships to veterinary students planning to practice equine medicine. The winners also receive a $300 travel stipend to attend the AAEP Convention where they accept the award. Students must apply during the fall semester of their fourth year of study. The Morris Animal Foundation’s Veterinary Student Scholars program is designed for veterinary students with an interest in clinical research. Stipends of up to $4,000 are awarded to students who complete 10- to 12-week research projects. Oxbow Animal Health offers two $500 scholarships for veterinary technicians with an interest in small animal and exotic animal medicine. A $1,000 scholarship is available to veterinary students with an interest in exotic animal medicine. Applications must be postmarked by March 1 and recipients are announced May 1. The Race for Education (in partnership with the American Association of Equine Practitioners) offers the Winner’s Circle scholarship program for third-year veterinary students with an interest in equine veterinary medicine. The awards range from $1,500 to $5,000 for fourth-year veterinary costs. Students must apply directly to their local SCAAEP (Student Chapter of the American Association of Equine Practitioners). One scholarship will be awarded in each of the 36 SCAAEP jurisdictions. The SEF awards a $3,000 scholarship to a third-year veterinary student from each U.S. veterinary school. Students must submit an essay related to the business concerns of private practice. One winner, judged to have the top essay overall, also receives a $15,000 award and a free trip to attend the North American Veterinary Conference. The U.S. Army HPSP offers full-tuition scholarships and monthly stipends for veterinary students who commit to three years of active duty. Applicants must be full-time veterinary students (and maintain this full-time status), hold United States citizenship, attend an accredited U.S. veterinary college, and meet all eligibility requirements to become a commissioned officer in the U.S. Army Reserve. VSTONE distributes a variety of scholarships and awards to residents of New England that are studying veterinary medicine. The trust has funded more than 500 students since its inception in 1958. Third- and fourth-year veterinary students may apply for $5,000 scholarships through the program. One winner will be selected from each of the six New England states. Applications are due December 1.